27 DEC 2017 | CLOTHES "MAKE THE MAN", BUT DO THEY FAKE THE SCAN? Have you ever wondered about the impact of your clothes on your BodySpec DXA results? You’re not alone. It’s one of the questions that we get most frequently, so we decided to find out! As you probably know, the recommended attire for a DXA scan is light workout clothes with minimal metal. But chances are if you forget your workout clothes, you’ll show up in a t-shirt and jeans. You probably wondered if the jeans were adding to your measured mass. Check out the t-shirt and jeans scan results! It turns out that this outfit alone is measured as approximately 0.1 lbs by the scanner. Indeed, if you look at the regional assessment, this mass was mostly concentrated in the jeans part (the legs). 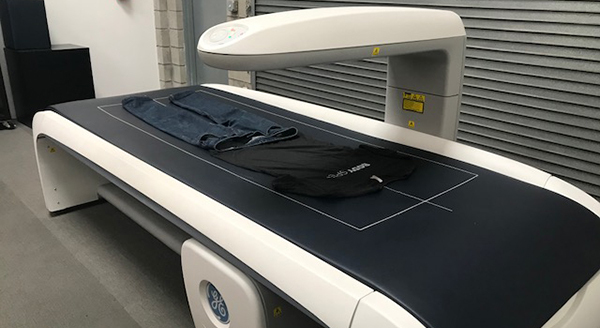 So it turns out that wearing jeans certainly won’t throw off your scan results by any means! Since the jeans don’t add much to your mass, they won’t impact your body composition results by any substantial amount either. What about if someone were to wear something more voluminous? To test this, we measured a different outfit: a puffy vest over a BodySpec t-shirt and some pants. Check out the puffy vest scan results! In comparison, this outfit was a little less lean. It was approximately 0.1 lbs – but categorized as mostly fat. After all, a puffy vest is not very dense. However, if you look at the regional assessment of the puffy vest scan, you’ll see that again, the contribution of each individual region was negligible. Only when they were all added together did their sum round up to 0.1 lbs. 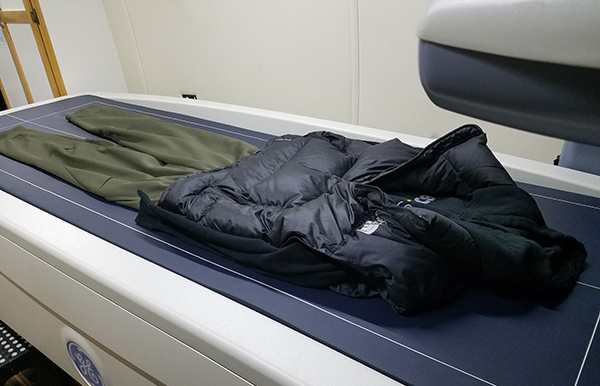 So even if you were to wear a puffy vest onto the scan table, the overall impact on your body composition would still be minuscule. But chances are that your BodySpec tech would ask you to remove that vest beforehand anyway. Clothing – especially light clothing – has a negligible impact on scan results. So don’t feel like you have to come in a bathing suit (or your birthday suit) to get accurate DXA results!